Motorola has taken to making fun of Apple in its ads for some of the issues with the iPhone 4 like the need for a case to prevent the antenna from not working. There are probably lots of Android fans getting a big kick out of the issues with the iPhone 4. 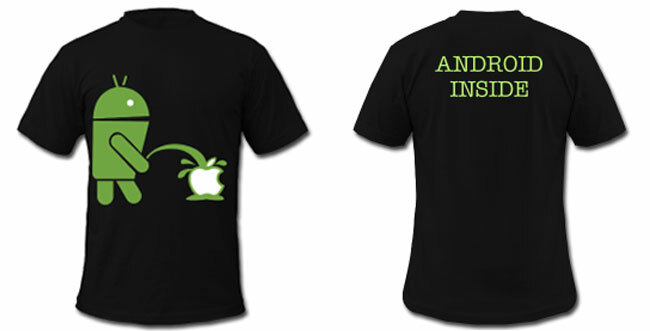 A new shirt has surfaced that is funny and Android fans that hate Apple will want it. The shirt is black and has a green android on the front that looks like the Google Android logo. The little bot is peeing on an apple with a bite out of it. The shirt isn’t officially licensed by Apple or Google, but the point is Android pisses on Apple. The shirt will cost you € 27.00 and is on a French site that isn’t clear about if it will ship to the US. Have a look and our article on Android vs iPhone to see which smartphone and mobile platform is best for you.